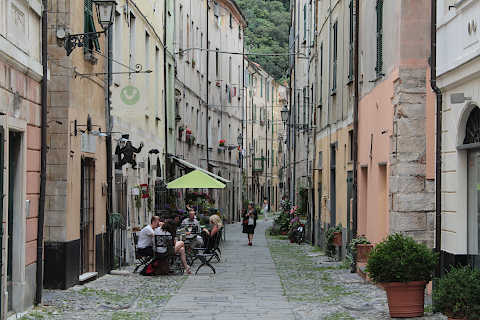 The village of Finalborgo (also referred to as Finale Borgo and Borgo di Finale) is a traditional village in western Liguria. 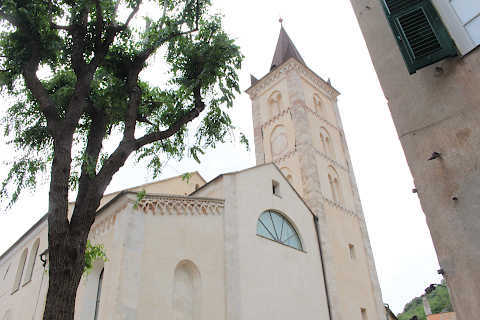 It is a couple of kilometres inland from the popular seaside resort of Finale Ligure and can be reached on foot as a trip from the resort. 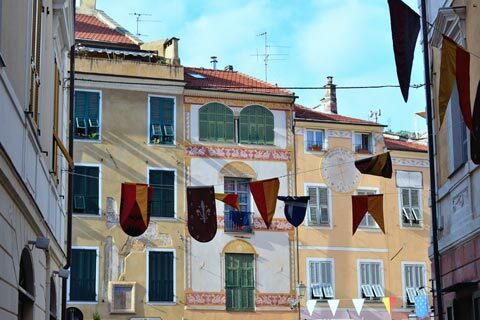 There is quite a contrast in character between the two places, and a stroll around ancient Finalborgo makes an interesting excursion if you are staying in the nearby bustling beach resort. The medieval village we see today developed in the 12th century when Saracen attacks from the sea were common and a fortified village on the hill was easier to defend than a coastal village. 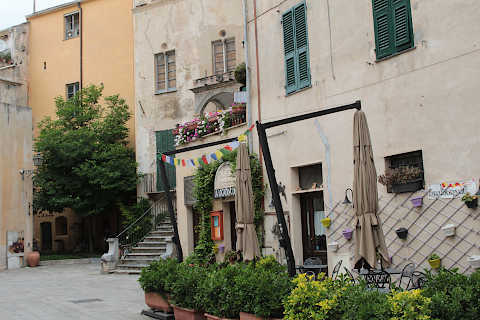 This ancient village has a great deal of character as well as a castle and several other historic monuments to see, which all helps explain why Finalborgo has ben listed as one of the 'most beautiful villages in Italy'. 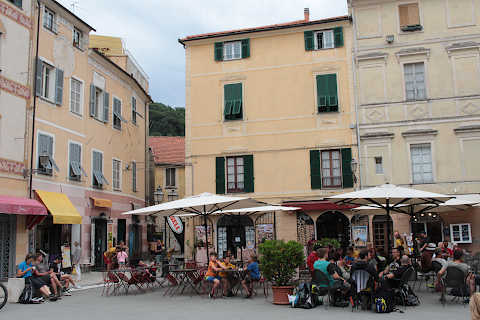 The ancient part of the village still retains its medieval walls and is centred around a pleasant square surrounded by an interesting mix of buildings, some in different pastel coloured buildings. 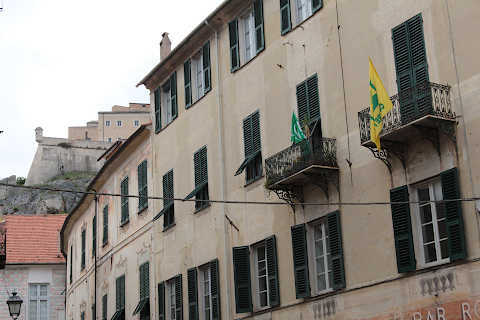 You will also notice various palazzos with notable architectural elements as you explore Finalborgo such as the Brunengo Palazzo in Piazza Aycardi with its loggia and the other palazzos on the same square. 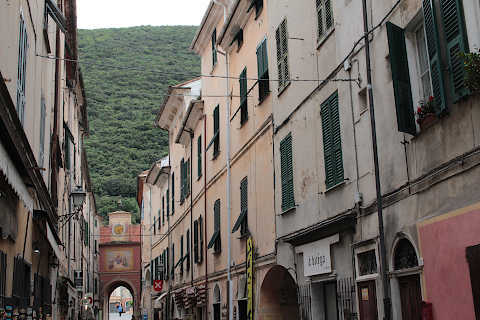 Various narrow pedestrian streets with cafes and ancient houses lead from the main square to the historic gateways into the town. 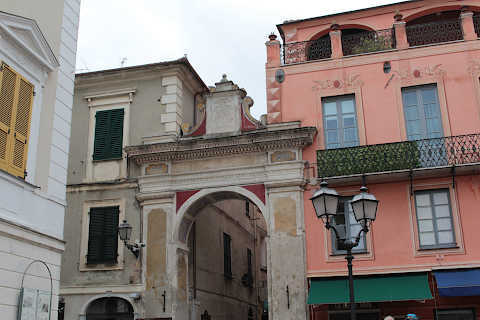 One feature that you will notice is the number of decoratively painted houses and arches in Finalborgo, such as the doorway that you pass through to reach Piazza San Biagio, the memorial arch in Piazza Garibaldi, the painted gate called Porta Testa on Via Nicotera and elsewhere in the historic centre and on other houses in the town. 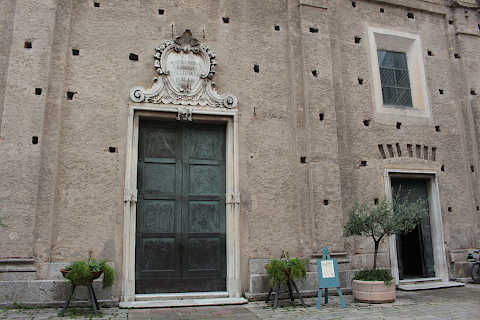 The courthouse in Finalborgo has its origins in the 14th century although it was modified several times in the following centuries. 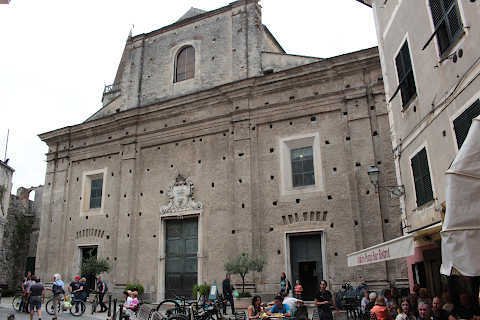 Its most unusual feature is the facade which incorporates numerous different syles and influences. 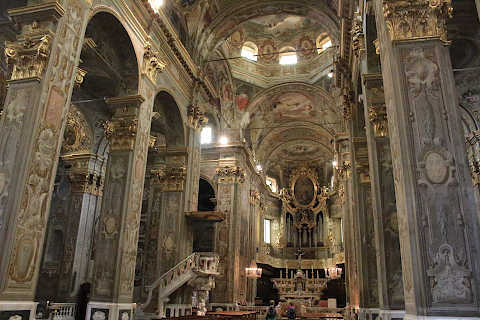 - the 17th century Collegiate Basilica of San Biagio which has a baroque facade and has retained a 15th century belltower and an interior which is beautifully decorated in golden colours and contains some interesting paintings and sculptures - you would never guess what an extraordinary interior is hidden behind the rather plain baroque style facade! 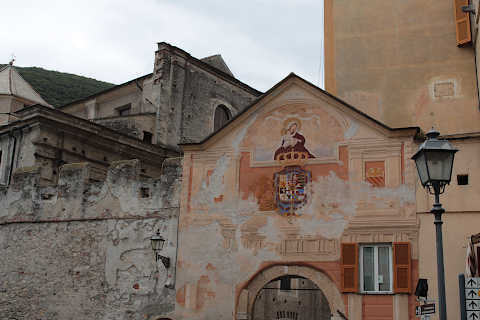 - the 14th century Convent of Santa Caterina, now home to the town Archaeology Museum, has cloisters and some 15th century frescoes. 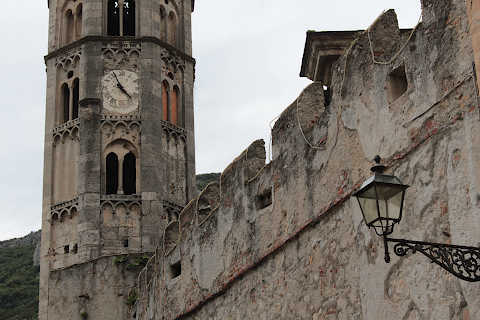 Another historic monument you will see in Finalborgo is the Castel San Giovanni that is high on a hill and overlooks the village. This is a Spanish fortress and is actually more recent than many of the buildings here having been built between 1640 and 1645 and extended in the 1670's - only to be abandoned in the early years of the following century. The area around Finalborgo is highly regarded by mountain bikers and we have never seen so many gathered in one place - clearly it is the place to come if you enjoy cycling through the Italian hills! 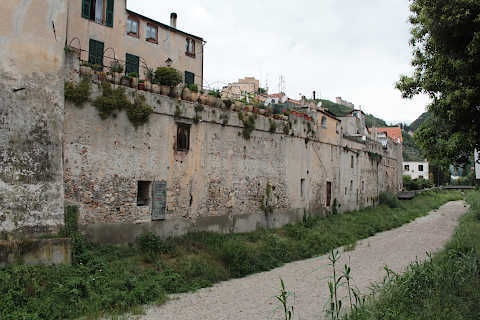 You can reach Finalborgo on foot from Finale Ligure, which takes about 30 minutes to walk, or of course you can drive here. 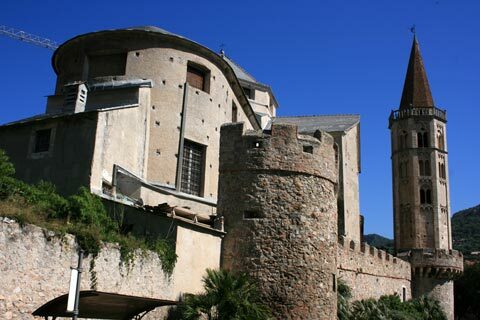 While you are exploring the Ligurian countryside you will also want to visit the medieval centre of the village at Borgio Verezzi and then Castelvecchio di Rocca to the west of here. If you are here for the beaches rather than the history there are also several other important seaside resorts along the Liguria coast nearby such as Noli to the north and Alassio to the south.